Our Gelato Chef Gino Parente from Frosinone, Italy has learned and perfected the tricks of the trade. In 2009, Gino brought his artistic ability to New York and the tri-state area with exquisite flavors. Our gelato is made daily to ensure the highest quality and authencity. We deem it necessary to import all of our ingredients from Italy with the exception of milk and sugar. Our products and services don't stop at gelato. We offer an espresso bar, an Italian vespa complete with a backdrop, customized Nutella labels, and so much more! Dolce and Gelato Catering can turn an ordinary wedding into a personalized elegant affair. We can provide old world gelato display cases color coordinated to your event, gelato served in stylish martini glasses decorated with fresh fruit and nut toppings complemented by a soaring chocolate fountain tower. Celebrate your Bar/Bat Mitzvah, Sweet 16, Quinceañera, Communion, Anniverary, milestone birthday, office party or any other themed event in style with Dolce and Gelato Catering. We have done many upscale themed affairs, which have included D&G servers who resembled old style cigarette girls. With elegance in hand delivering personalized gelato in customized trays that overflowed with the smoke effect of dry ice. We also offer Kosher and Parve gelato and toppings. 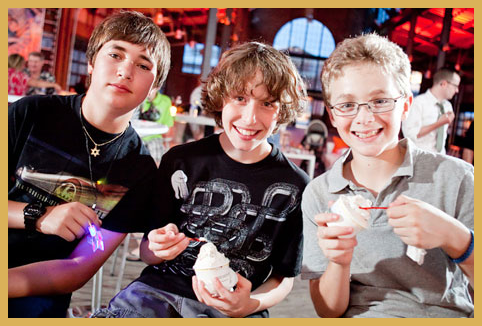 Dolce and Gelato Catering has been involved annually with numerous non for profit fundraisers. We had generously donated to Cancer for Kids, Winthrop Children's Hospital, Cohen Children's Hospital, Long Island Jewish Hospital, Harboring Hearts, American Cancer Society and More! Dolce & Gelato catering provides soy and water based gelato and sorbet. We use a dedicated gelato machine and display cabinet to meet your needs. Kashrus Certification. Dolce & Gelato catering can accommodate, celiac, nut and tree allergies, lactose intolerance / dairy, fruit allergies ie. strawberry and diabetics. If you have any question or concerns regarding ingredients or allergies please contact us. We couldn't have expected more from Dolce and Gelato! They provided our guests with more gelato than they had ever seen. We chose 24 flavors and they all were great! - Nick and Rachel P.
It was a pleasure to have our dessert catered by Dolce and Gelato. The gelato was the highlight of the night and we couldn't have made our guests happier. Great job! You guys were a hit! 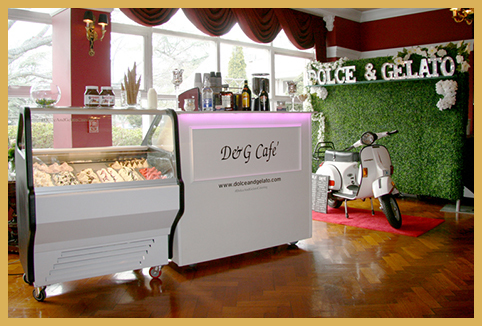 We loved having Dolce and Gelato catering at our wedding at the Garden City Hotel. Gino and I were in touch only a month before my wedding (thanks to myself for being last minute) and I am so happy I booked this company. Our family and friends couldn't stop talking about how cool it was to bring a piece of Italy to our venue. We had gelato carts, espresso, cappuccino, and even a real Vespa!! Our friends loved taking pictures next to it and the gelato and espresso were out of this world. From the Nutella jars with our names on it, to the staff who spoke Italian, to the LED light that lit up the carts. We are so happy to have used them and I look forward to having them at more parties we throw in the future! Dolce and Gelato was incredible! Despite being so last minute with booking (1 week before the wedding!) Gino was hands on and made it happen… I am so glad I called them. Our guests swooned over the delicious flavors and Nutella jars that had our names on them. The cart size was perfect for the number of guests we had and the set-up was even better than I imagined. Everything was so delicious and servers even spoke Italian. I will definitely be using them for my next party! Thanks so much Dolce and Gelato! Dolce and Gelato was fantastic. Gino was on top of everything leading up to the event and coordinated with my venue to ensure that it went smoothly the day off. The Staff was great and people absolutely loved the cart. It was busy the entire time that it was there! Thank you so much Gino and team. Dolce and Gelato is amazing! It was the perfect touch to my wedding. My husband and I couldn't have been happier with the service. All my guests are still talking about how delicious and unique it was. Thank you to Gino and his staff for all their hard work and dedication! I hired Dolce and Gelato Catering for my Engagement party this past Labor Day Weekend and they were nothing short of perfect! Working with Gino was fun and pleasant and he knew and understood exactly what my Fiancé and I were looking for. From the delicious gourmet Gelato, to the white Vespa, the Italian speaking staff and the Espresso bar, you felt like you were in Italy. I would highly recommend this company for your Special Event! Highly recommend! Dolce and Gelato was a wonderful addition to our wedding's dessert selection. The staff were great to work with and the gelato was absolutely delicious. The cart had so many flavors plus espressos and cappuccinos. The personalized Nutellas made for a sweet touch, we still have them! 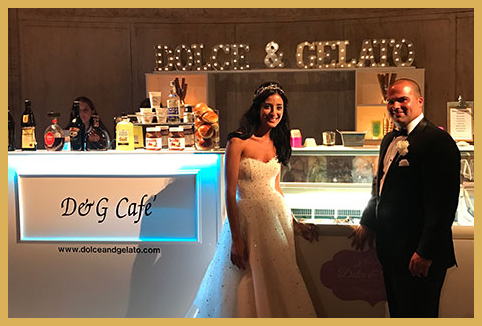 We, along with our family and wedding guests, absolutely loved Dolce and Gelato! Thank you for helping make our special day even more memorable! Amazing, my relatives from Italy felt like they never left home. The presentation with the Gelato Cart was great along with the espresso and cappuccino, which some of my guests are still taking about. And we appreciate the photos taken also, what a great touch to our day. So delicious and a crowd favorite! Everyone was amazed by this at the wedding and it was my favorite part of the night. They even personalized Nutella bottles with our names on it! Worked to give us our flavor picks! Perfection. I had the pleasure of working with the Dolce and Gelato Staff for my wedding. The staff was absolutely a delight. They were professional in the way they presented themselves, treated guests and everything in between. The decision to use this company was by far one of the best I’ve made in my wedding process. The gelato was fresh, delicious and absolutely gorgeous. 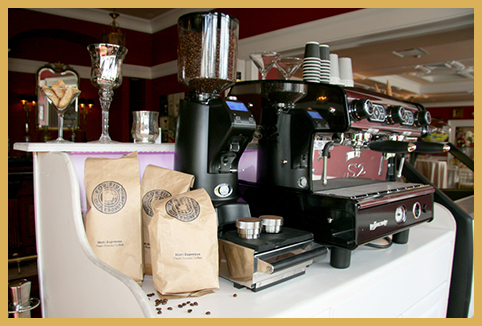 My guests are still raving about the gelato and expresso and our wedding! I recommend using this company to all planning a wedding, engagement party, and/or shower! I am forever thankful to the wonderful staff who made my wedding extra sweet! View more testimonials featured on The Knot!